احمدی, امین, فخری, منصور, عاملی, علیرضا, آدرسی, مصطفی. (1396). بررسی آزمایشگاهی عملکرد بلندمدت مخلوط‌های آسفالتی گرم حاوی سرباره فولاد و تراشه آسفالتی. پژوهشنامه حمل و نقل, 14(3), 23-38. امین احمدی; منصور فخری; علیرضا عاملی; مصطفی آدرسی. "بررسی آزمایشگاهی عملکرد بلندمدت مخلوط‌های آسفالتی گرم حاوی سرباره فولاد و تراشه آسفالتی". پژوهشنامه حمل و نقل, 14, 3, 1396, 23-38. احمدی, امین, فخری, منصور, عاملی, علیرضا, آدرسی, مصطفی. (1396). 'بررسی آزمایشگاهی عملکرد بلندمدت مخلوط‌های آسفالتی گرم حاوی سرباره فولاد و تراشه آسفالتی', پژوهشنامه حمل و نقل, 14(3), pp. 23-38. احمدی, امین, فخری, منصور, عاملی, علیرضا, آدرسی, مصطفی. بررسی آزمایشگاهی عملکرد بلندمدت مخلوط‌های آسفالتی گرم حاوی سرباره فولاد و تراشه آسفالتی. پژوهشنامه حمل و نقل, 1396; 14(3): 23-38. بازیافت سرباره فولاد در مخلوط­های آسفالتی عملکرد آنها را بهبود می­بخشد ولی افزایش مصرف قیر در اثر این بازیافت کاربرد گسترده آنها را با مانع مواجه کرده است. برای رفع این مانع در این تحقیق اثر بازیافت همزمان سرباره فولاد و تراشه آسفالتی در مخلوط­های آسفالتی گرم مورد ارزیابی قرار گرفته است. بدین منظور شش مخلوط آسفالتی با دو درصد مختلف از درشت­دانه سرباره فولاد (0 و 40%) و سه درصد مختلف از ریزدانه تراشه آسفالتی (0، 20 و 40%) در دو حالت پیرشده کوتاه و بلند مدت ساخته شد و مقاومت آنها در برابر شیارشدگی، ترک خوردگی و آسیب­های رطوبتی اندازه­گیری شده و به شکل آماری با هم مقایسه شدند. نتایج نشان داد که افزودن سرباره فولاد و تراشه آسفالتی به شکل چشمگیری مقاومت در برابر شیارشدگی و ترک خوردگی را افزایش می­دهد. با این حال افزودن تراشه آسفالتی و سرباره فولاد به ترتیب منجر به کاهش و افزایش شکل­پذیری مخلوط­های آسفالتی در آزمایش کشش غیر مستقیم شدند. از طرف دیگر در حالی که افزودن تراشه آسفالتی حساسیت رطوبتی مخلوط­ها را کاهش داد، افزودن سرباره فولاد این حساسیت را تشدید کرد. 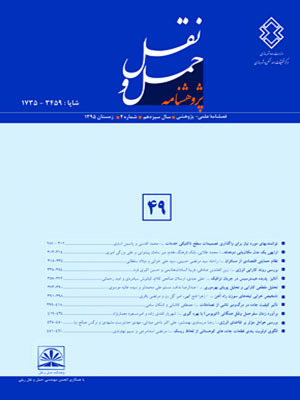 در مجموع ثابت شد که مخلوط­هایی که همزمان هر دو این مصالح در آنها بازیافت شده است، نه تنها به لحاظ اقتصادی و زیست محیطی بسیار مطلوب ارزیابی می­شوند بلکه عملکردی قابل قبول و در برخی جهات بهتری از مخلوط­های کنترل و یا مخلوط­هایی که تنها یکی از دو این مصالح را دربردارند از خود نشان می­دهند. 1Ph.D. Student, Department of Civil Engineering, K.N. Toosi University, Tehran, Iran. 4Assistant Prof., Department of civil Engineering, Shahid Rajaee Teacher Training University, Tehran, Iran. Recycling Steel slag aggregates into the asphalt mixes improves their performance; however, increasing the bitumen consumption as a result of this recycling bridle its wide spread application. To overcome this difficulty, this research investigates feasibility of concurrent recycling of reclaimed asphalt pavement (RAP) and steel slag into the warm mix asphalt. To this end, six types of asphalt mixture with two coarse steel slag aggregate percentages (0 and 40%) and three RAP contents (0, 20, and 40%) were prepared in two states of aging (short- and long term) and their resistance against rutting, cracking, and moisture-induced damages were examined and compared statistically. Results showed that incorporation of steel slag aggregates and RAP enhances the rutting and cracking performance of mixes; however, the former reduces and the latter one increases the moisture susceptibility. On the other hand, inclusion of RAP and steel slag in mixes respectively degrades and promotes the deformation of asphalt mix at the failure in indirect tension test. Overall, it is proven that simultaneous recycling of steel slag and RAP into the WMA not only is beneficial from economic and environmental perspective, but also leads to a mix which performs better or at least comparable to the conventional mixes and also the mixes that are made with one of these waste materials. -AASHTO R30, (2001), "Standard practice for mixture conditioning of hot mix asphalt (HMA)". Standard Specification, American Association of State Highway and Transportation Officials, Washington, DC. -Ameri M., Hesami S., Goli H. (2013), "Laboratory evaluation of warm mix asphalt mixtures containing electric arc furnace (EAF) steel slag". Construction and Building materials pp.49611–617. -ASTM D5106-15, "Standard Specification for Steel Slag Aggregates for Bituminous Paving Mixtures". -ASTM D-6927-07, "Standard test method for Marshall Stability and flow of bituminous mixtures". -Barandica J. M., Fernández-Sánchez G, Berzosa Á, Delgado J A, Acosta F J (2013), "Applying life cycle thinking to reduce greenhouse gas emissions from road projects". Journal of Cleaner Production, pp.5779-91. -Blankendaal T., Schuur P., Voordijk H. (2014), "Reducing the environmental impact of concrete and asphalt: a scenario approach". Journal of cleaner production pp.6627-36. -Buss A., Williams R. C., Schram S. (2016), "Evaluation of moisture susceptibility tests for warm mix asphalts. Construction and Building Materials 102", pp. pp.358-366. http://dx.doi.org/10.1016/j.conbuildmat.2015.11.010. -Carvajal Munoz J. S., Kaseer F., Arambula E., Epps Martin A. (2015), "Use of the Resilient Modulus Test to Characterize Asphalt Mixtures with Recycled Materials and Recycling Agents". Transportation Research Record: Journal of the Transportation Research Board(2506): pp.45-53, http://dx.doi.org/10.3141/2506-05. -Chen J-S., Wei, S-H, (2016), "Engineering properties and performance of asphalt mixtures incorporating steel slag". Construction and Building Materials 128148–153, http://dx.doi.org/10.1016/j.conbuildmat.2016.10.027. -Copeland A., D'Angelo J., Dongre R., Belagutti S., Sholar G., (2010), "Field evaluation of high reclaimed asphalt pavement-warm-mix asphalt project in Florida: case study. Transportation Research Record: Journal of the Transportation Research Board", (2179): pp.93–101, http://dx.doi.org/10.3141/2179-11. -Fakhri M., Hosseini S. A., (2017), "Laboratory evaluation of rutting and moisture damage resistance of glass fiber modified warm mix asphalt incorporating high RAP proportion". Construction and Building Materials 134626-640,http://dx.doi.org/10.1016/j.conbuildmat.2016.12. pp.168. -Ferreira V. J., Vilaplana A. S-D-G, García-Armingol T, Aranda-Usón A, Lausín-González C, López-Sabirón A M, Ferreira G (2016), "Evaluation of the steel slag incorporation as coarse aggregate for road construction: technical requirements and environmental impact assessment". Journal of Cleaner Production 130175–186, http://dx.doi.org, 2015.08.094. -Johnson E., Watson M., Olson, R., Moon K. H., Turos M, Marasteanu M (2013), "Recycled asphalt pavement: Study of high-RAP asphalt mixtures on minnesota county roads". Minnesota Department of Transportation, Final Report 152013. -Kavussi A, Qazizadeh M. J., (2014), "Fatigue characterization of asphalt mixes containing electric arc furnace (EAF) steel slag subjected to long term aging". Construction and Building Materials 721, pp.58–166, https://doi.org/10.1016/j.conbuildmat.2014.08.052. -Kazmee H., Tutumluer E., Beshears S., (2016), "Using accelerated pavement testing to evaluate reclaimed asphalt pavement materials for pavement unbound granular layers. J. Mater". Civ. Eng.04016205, .http://dx.doi.org/10.1061/(ASCE)MT. -Kusam A., Malladi, H., Tayebali, A. A., Khosla N. P., (2016), "Laboratory evaluation of workability and moisture susceptibility of warm-mix asphalt mixtures containing recycled asphalt pavements". J. Mater. Civ. Eng.04016276,http://dx.doi.org/10/(ASCE)MT.1943-5533.0001825. -Liapis, I., Likoydis, S. (2012), "Use of electric arc furnace slag in thin skid-resistant surfacing". Procedia - Social and Behavioral Sciences 48, pp.907–918. -Lu. D. X., Saleh, M. (2016), "Laboratory evaluation of warm mix asphalt incorporating high RAP proportion by using evotherm and sylvaroad additives". Construction and Building Materials 114, pp.580–587. -Masoudi S., Abtahi, S. M., Goli A., (2017), "Evaluation of electric arc furnace steel slag coarse aggregate in warm mix asphalt subjected to long-term aging. Construction and Building Materials", 135260-266, http://dx.doi.org/10.1016/j.conbuildmat.2016.12.177. -Mensching D J, Daniel J S, Bennert T, Medeiros Jr M S, Elwardany M D, Mogawer W, Hajj E Y, Alavi M Z (2014), "Low-temperature properties of plant-produced RAP mixtures in the Northeast". Road Materials and Pavement Design 15(sup1): pp.1-27. -NCHRP, (2001), "Recommended use of reclaimed asphalt pavement in the Superpave mix design method: technician's manual, Report 452. National Cooperative Highway Research Program, Washington, DC. -Nejad, F. M, Azarhoosh, A., Hamedi G. H., Roshani, H., (2014), "Rutting performance prediction of warm mix asphalt containing reclaimed asphalt pavements". Road Materials and Pavement Design 15(1): pp.207–219, http://dx.doi.org/10.1080/14680629.2013.868820. -Palankar N., Ravi Shankar, A., Mithun, B. (2015), "Investigations on Alkali-Activated Slag/Fly Ash Concrete with steel slag coarse aggregate for pavement structures". International Journal of Pavement Engineering pp.1–13, http://dx.doi.org/10.1080/10298436.2015.1095902. -Park P, El-Tawil S, Park, S-Y, Naaman A. E., (2015), "Cracking resistance of fiber reinforced asphalt concrete at− 20° C". Construction and Building Materials, pp.8147-57. -Pasetto M., Baldo, N. (2011), "Mix design and performance analysis of asphalt concretes with electric arc furnace slag. Construction and Building Materials 25(8): pp.3458–3468, http://dx.doi.org/10.1016/j.conbuildmat.2011.03.037. -Pasetto M., Baldo N. (2012), "Performance comparative analysis of stone mastic asphalts with electric arc furnace steel slag: a laboratory evaluation. Mater". Struct. 45(3): 411-424, http://dx.doi.org/10.1617/s11527-011-9773-2. Patel J P, 2008, Broader use of steel slag aggregates in concrete. Cleveland state university. -Raposeiras A., Vargas-Cerón A, Movilla-Quesada D, Castro-Fresno D (2016), "Effect of copper slag addition on mechanical behavior of asphalt mixes containing reclaimed asphalt pavement. Construction and Building Materials 119268–276, http://dx.doi.org/10.1016/j.conbuildmat.2016.05.081. -Rogers, W., (2011), "Influence of warm mix additives upon high RAP asphalt mixes", Clemson University. -Stimilli A, Virgili A, Giuliani F, Canestrari F (2016), "Mix design validation through performance-related analysis of in plant asphalt mixtures containing high RAP content. International Journal of Pavement Research and Technology, http://dx.doi.org/10.1016/j.ijprt.2016.07.002. -Tarbox, S., Daniel, J., (2012). "Effects of Long-Term Oven Aging on Reclaimed Asphalt Pavement Mixtures". Transportation Research Record: Journal of the Transportation Research Board(2294): pp.1-15, http://dx.doi.org/10.3141/2294-01. "Tar-containing reclaimed asphalt–Environmental and cost assessments for two treatment scenarios. Journal of Cleaner Production, pp.81201-81210. -West R C., Rada G. R., Willis J. R., Marasteanu M. O., (2013), "Improved mix design, evaluation, and materials management practices for hot mix asphalt with high reclaimed asphalt pavement content". Transportation Research Board. -Xie J, Chen Z, Pang L, Wu S., (2014), "Implementation of modified pull-off test by UTM to investigate bonding characteristics of bitumen and basic oxygen furnace slag (BOF)", Construction and Building Materials pp.5761–5768, http://dx.doi.org/10.1016/j.conbuildmat.2014.01.083. -Xie J., Wu, S., Lin J., Cai J., Chen Z., Wei, W. (2012), "Recycling of basic oxygen furnace slag in asphalt mixture: material characterization & moisture damage investigation. Construction and Building Materials pp.36467–3474, http://dx.doi.org/10.1016/j.conbuildmat.2012.06.023.